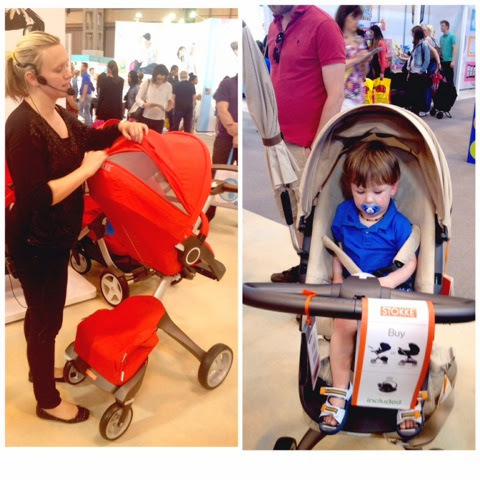 We've spent the day today at the NEC Birmingham for The Baby Show 2014. The Baby Show is the UK's number one pregnancy and parenting event attended by hundreds of the most reputable names in the baby business and of course showcases lots of great new innovative products every year. What I love about The Baby Show is that for me I get to meet the faces behind emails and Twitter accounts. I follow many of these companies on their social media accounts and love to see what they are up to. It's nice to get demonstrations on their new products. It is also great for meeting new people and finding products I didn't know much about. With us expecting baby number three in a few months I was interested in looking at the different pushchairs on the market at the moment. I'd been eyeing up the Stokke Xplory, which isn't new, but it is one I've always wanted a play with. I got a great demonstration on the stand and they even let me try Zach in the seat so I could see the size and comfort of the seat unit. I also had to stop off at the Cosatto stand as I'm a huge fan and we've bought many Cosatto items in the past. 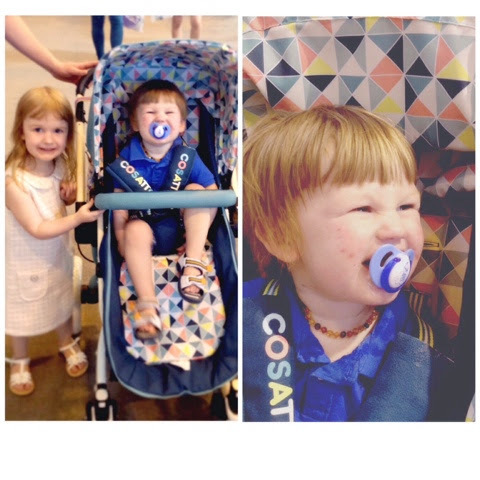 On the Cosatto stand the two main attractions are the Giggle and the Ooba travel systems. I love the Giggle in 'Pixelate' and 'Red Bubble' the patterns are so eye catching and I love to have a pushchair that stands out. I also love and recommend the Ooba! We were lucky enough to be loaned the Ooba for a few hours to see what we thought and surprisingly we all loved it. Andy doesn't usually feel pushchair love but he was really impressed by the Ooba. Here is Zach road testing it, as you can see he definitely approved! If you love a good gadget you must visit the Foppapedretti stand and ask for a demo of the MYO Tronic. It is an electronic pushchair which is compatible with carrycot, seat unit or car seat and features a battery powered electric motor that propels at an adjustable speed, eliminating the effort of pushing and it is all operated from the adjustable handle bar. I was in awe of this pushchair, it is just so clever and I was amazed when I got to push it myself. Definitely worth a look! They do have a non electric version which is massively cheaper and the only difference is the missing motor so if you are looking for a more reasonably priced pushchair you could also take a look at that too. Of course The Baby Show is about more than just pushchairs! 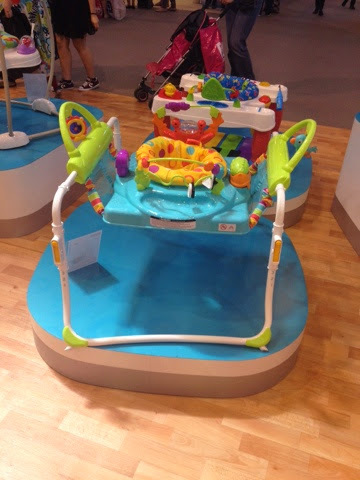 A few other products that caught my eye were the new Fisher Price Step & Play Jumperoo, I actually saw a baby playing in this so saw it in all it's glory and it is fantastic as well as entertaining a small child with stimulating colours and the ability to bounce, the new jumperoo can also move forwards and backwards to help baby with their first steps. I also got to see the new glass bottles from MAM which I had been curious to see. Like all MAM bottles they look fab and they are not how I expected them to be at all. When you think of glass bottles you think of flimsy glass and wonder if they are safe but these seemed very strong and are half price for the duration of the show. The play areas at the show are fab. I took both kids with me (Gracie is 3.5yrs and Zach 18 months) and they both loved playing in the Fisher Price and Vtech play stations. Both have toys set out in a small area with seats for adults to supervise their children. 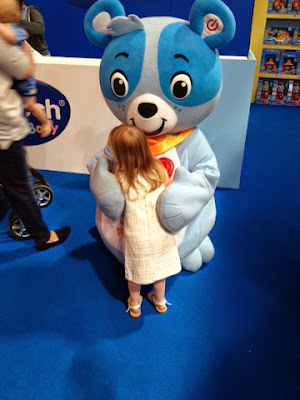 I loved how Fisher Price had thrown in one or two retro toys for the kids to enjoy too! Vtech had a giant teddy on hand to give kids cuddles and high fives which my two took full advantage of. Don't forget to pick up a Prima Baby & Pregnancy goody bag while you are there for just £2. As usual they have filled it with lots of fab little bits for pregnant women as well as young children. There were a few little toys and a sticker book my two claimed, a few bits like nappies/cream I've put away for baby number 3 and a lovely Cusson's Mum and Me set for me to enjoy along with some Breastfeeding bits and a small MAM self-sterilising bottle. 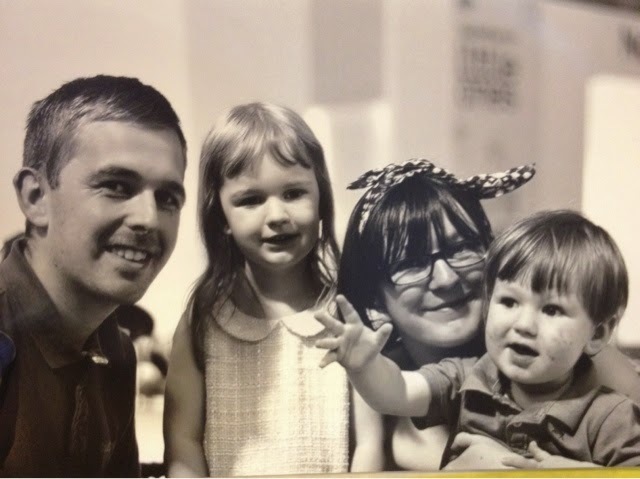 We also went to have pictures taken of the kids at the Bumpkins 'Face of the Baby Show' competition area. I wasn't keen on the kids single photos, they don't like strangers taking their photos but we got a lovely photo of the four of us which is very rare! Definitely worth a stop as there is no obligation to buy pics you don't like!